For the Western Hemisphere marsupial, see opossum. Possum is the common name for any of the small- to medium-sized arboreal marsupials comprising the mammalian suborder Phalangeriformes of the order Diprotodontia and native to Australia, New Guinea, and Sulawesi (and introduced to New Zealand). Possums are characterized by nocturnal and omnivorous behaviors, a long tail, woolly fur, and syndactylous hind feet (united by skin at the top joint but divided at the claws). Some limit the name possum to the members of the family Phalangeridae, a group that also includes mammals with the common name of cuscus. In all, there are about 64 species in Phalangeriformes, spread over six families. A similar group of marsupial mammals belonging to the order Didelphimorphia, and found in the Western Hemisphere, are known by the common name of opossum. The term possum also is used in North America as a diminutive for the Virginia opossum. In their natural environment, possums provide important ecological values as part of food chains and in seed dispersal. 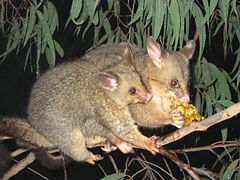 Possums consume such foods as plant matter (leaves, fruit, flowers), insects, and bird eggs, and are consumed by such carnivores as owls, dingoes, pythons, and foxes. For humans, they also were an important part of the Aboriginal diet and used for Aboriginal clothing. However, the introduction of the common brushtail possum to New Zealand, in an effort to establish a fur industry, has been an ecological disaster, as they have no natural predators. As an invasive species in New Zealand, their population numbers have exploded, causing damage to the native flora and fauna and serving as a carrier of bovine tuberculosis. Phalangeriformes is one of three suborders within the order Diprotodontia. In addition to the possums, the order Diprotodontia includes the kangaroos, wallabies, koala, wombats, and many others. Extant diprotodonts are restricted to Australasia. There are two key anatomical features that, in combination, identify diprotodontia. Members of the order are, first, diprotodont (meaning "two front teeth"): they have a pair of large, procumbent incisors on the lower jaw, a common feature of many early groups of mammals and mammaliforms. The diprotodont jaw is short, usually with three pairs of upper incisors and no lower canines. The second trait distinguishing diprotodonts is syndactyly, a fusing of the second and third digits of the foot up to the base of the claws, which leaves the claws themselves separate. The possums, the common name for members of Phalangeriformes, resemble in appearance the opossums of the Americas, and it is from these that their name is derived. (The name is from Algonquian wapathemwa, not Greek or Latin, so the plural is possums, not possa.) (Possum is also used in North America as a short form of opossum.) The Western Hemisphere opossums, of which there are more than 60 species, are characterized by a long, naked tail; a long, pointed snout; opposable thumbs in the hands and feet; and ears that are naked (Grzimek et al. 2004). Possums are small marsupials with brown or gray fur, ranging in size and weight from the length of a finger or 170 grams (6 ounces) (pygmy possums and wrist-winged gliders), to the length of 120 centimeters (four feet) or 14.5 kilograms (32 pounds) (brushtails and ringtails). In general, though, the larger possums are about the same size as a well-fed domestic cat. The two most common species of possums, the common brushtail and common ringtail, are also among the largest. The possum's rank odor is due to its large musk glands located behind each ear. All possums are nocturnal and omnivorous, hiding in a nest in a hollow tree during the day and coming out during the night to forage for food. They fill much the same role in the Australian ecosystem that squirrels fill in the northern hemisphere and are broadly similar in appearance. The Phalangeriformes suborder is divided into two superfamilies, Petauroidea (ringtail possums and gliders) and Phalangeroidea (brushtail possums, cuscuses, and pygmy possums). There are four families in the Petauroidea superfamily: Acrobatidae (feathertail gliders and pyrmy gliders), Petauridae (gliders, Leadbeater's possum, and striped possum), Pseudocheiridae (ringtail possums), and Tarsipedidae (honey possum). There are two families in the Phalangeroidea superfamily: Burramyidae (pygmy possums) and Phalangeridae (brushtail possums and cuscuses) (Myers et al. 2008). Cuscus is the common name generally given to the species within four genera of Phalangeridae: Ailurops, Phalanger, Spilocuscus, and Strigocuscus. The possum has been a part of Australian culture and folklore since the original indigenous inhabitants of the country. Australian Aborigines once used possum hides while playing the traditional game of Marn Grook. Possum-skin cloaks were important clothing for Aborigines from the south-east, as well as being important clan heirlooms. Possums are commonly found in suburban areas, where they are often considered pests owing to their habit of eating fruit, vegetables, flowers and tender young shoots from gardens, and nesting in roofs. The loud hissing, crackling territorial call of the male common brushtail may also be a problem for suburban residents. Natural deterrents that play upon the possum's acute sense of smell are often employed to discourage them. These include cloves of garlic, camphor, or naphthalene. As a native species in Australia, possums are protected by Australian regulations, even when they reside in urban neighborhoods, and cannot be baited. They cannot be killed as pests, to the irritation of many homeowners, and if captured, the regulations stipulate that they must be released within a small radius of that locality, since they are territorial creatures. Preventative measures such as blocking off their access to the roof spaces or building a possum nesting box for an alternative home are instead recommended. Although the common brushtail and (to a lesser extent) ringtail possums have adapted well to the urban environment, many of the lesser-known species are reduced in number, threatened, or endangered. The common brushtail possum was introduced to New Zealand by European settlers in an attempt to establish a fur industry. They soon escaped into the wild where they have thrived as an invasive species with great numbers: around 60 million individuals are estimated to live in New Zealand. There are no native predators of the possum in New Zealand. There have been numerous attempts to eradicate them because of the damage they do to native trees and wildlife, as well as acting as a carrier of bovine tuberculosis. For New Zealand, the introduction of possums has resulted in as much of an ecological disaster as the introduction of rabbits has been in Australia. About two-thirds of Australian marsupials belong to the order Diprotodontia, which is split into three suborders: the Vombatiformes (wombats and the koala, four species in total); the large and diverse Phalangeriformes (the possums), and Macropodiformes (kangaroos, potoroos, wallabies, and the musky rat-kangaroo). Groves, C. 2005a. Superfamily Phalangeroidea. Pages 44-49 in D. E. Wilson, and D. M.Reeder, eds., Mammal Species of the World, 3rd edition. Johns Hopkins University Press. ISBN 0801882214. Groves, C. 2005b. Superfamily Petauroidea. Pages 50-56 in D. E. Wilson, and D. M.Reeder, eds., Mammal Species of the World, 3rd edition. Johns Hopkins University Press. ISBN 0801882214. Integrated Taxonomic Information System (ITIS). 2006. Phalangeriformes Szalay in Archer (ed. ), 1982 ITIS Taxonomic Serial No. : 709306. Retrieved August 29, 2008. Myers, P., R. Espinosa, C. S. Parr, T. Jones, G. S. Hammond, and T. A. Dewey. 2008. Suborder Phalangeriformes (possums and cuscuses). Animal Diversity Web (online). Retrieved August 29, 2008. Myers, P. 2002. Phalangeridae. Animal Diversity Web. Retrieved August 29, 2008. This page was last modified on 15 May 2012, at 20:30.